Products trademarked iTEKIRO are marketed and sold exclusively by EPMUSA at Amazon.com. 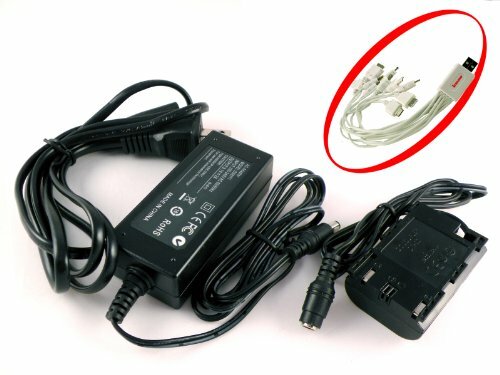 This AC adapter power supply cord works with Canon EOS 5D Mark II, EOS 5D Mark III, EOS 6D, EOS 7D, EOS 60D, EOS 60Da DSLR cameras. It allows you to use your camera continuously for a heavy indoor job. Powering your device with the adapter, you can shoot pictures, download images, watch photos, and meanwhile you don't lose the precious battery charge. It is great for charging battery in the camera, saving battery power and reducing battery charging downtime. Input: AC 100 ~ 240V worldwide compatible; Output: 8.1VDC 2A; Dimensions: 3.5" x 1.5" x 1"; Weight: 4.6 oz (2-prong AC power cord included). Please note the adapter is not original, it is a replacement made by iTEKIRO. Your purchase of this adapter comes with 100% satisfaction of 30-day money back and 1 year replacement warranty, plus a complimentary 10-in-1 USB charging cable for most smart phones, cellular phones, E-Book readers, GPS, MP3 / MP4 players, and digital cameras. If you have any questions about this product by iTEKIRO, contact us by completing and submitting the form below. If you are looking for a specif part number, please include it with your message.